KUALA LUMPUR, March 6, 2014 – The weather in Malaysia is expected to return to normal from mid-March through April with increased rainfall, with the exception of Sarawak which had been showing some anomalies in precipitation. Director of the Central Weather Forecast of the Meteorological Department, Dr Muhammad Helmi Abdullah said the haze situation would also improve with increasing rainfall. At a special briefing on Climate Change in Malaysia here today, Dr Muhammad Helmi said the drought conditions experienced now will not worsen as claimed by certain quarters. 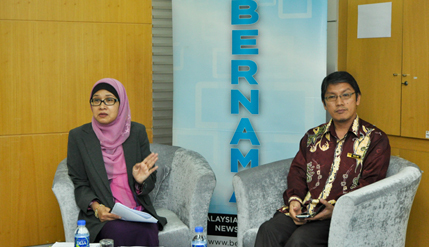 The National University of Malaysia’s (UKM) News Portal was invited by the organiser of the briefing, the Malaysian National News Agency (BERNAMA) to attend the talk at its headquarters in Jalan Tun Razak here. Dr Helmi said the month of Feb 2014 went into the record books as the month with the least rainfall compared to the same month of the previous years since 1980. He said despite the current drought, the worst since 1979-1980, rain is anticipated for the end of the South-East Monsoon in mid-March before the monsoon transition cycle begins again. “Most areas in Peninsular Malaysia received 80 percent less rainfall than the average, while Sarawak experienced about 60 percent less rainfall with Sabah receiving more rain. Thus there is no problem of water shortage in East Malaysia,” he said. Director General of the Meteorological Department , Datuk Dr Che Gayah Ismail said 40 more automatic weather stations would be set up by the end of the year in every district across the country in addition to the 108 existing stations to further boost the accuracy of prediction and to meet developmental needs. The budget for the project have already been received. More observation stations will enable the Meteorological Department to fine-tune the weather predictions, Che Gayah said. Large-scale agriculture needs a lot of weather information for the feasibility study and her department needed to know whether certain crops were suited to be planted as well as the correct timing.